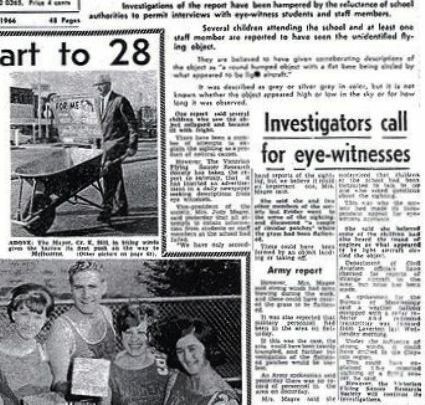 In april 1966 in Melbourne over 200 students and teachers of 2 Victorian State schools witnessed a UFO descend into a nearby field. The field is called ‘The Grange” (a house, often with farm), now a nature reserve. Afterwards the UFO flew back in northwest direction towards the suburb of Clayton South. 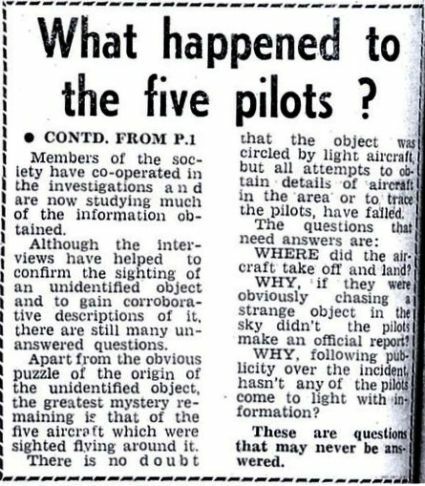 On wednesday 6th of april 1966 around 11:00 am a group of students and a teacher of Westall High School(now the Westall Secondary College) at the very end of their hour of sport they noticed an unknown flying object. They describe the strange object as a grayish, saucer-shaped vehicle, twice as big as a family car. The statements of witnesses were getting a bit mixed up because Adrew Greenwood, a sience teacher told to ‘The Dandenong Journal’ that he saw a silvery green disc. According to the witnesses the object descend and flew towards the southwest part of the school to disappear behind a treeline in southeast direction into the field of The Grange straight across the Westall State School for Primary Students. After a period of about 20 minutes over 200 witnesses have seen the UFO lift back up and with increasing speed move towards the northwest. Some witnesses stated that while the UFO gained altitude it was chased by 5 other UFOs that circeled aroudn the object. On sunday 9th of April the landing site was invistigated by ‘men in uniform’, presumably men of the Australian army and the Roayal Australian Air Force. Even the local police would have visited the site. Eyewitnesses stated that the grass on the landsite was burned and that samples were taken. However some know that the owner of the field intentionally had set fire to some grass to scare off playing children. Serveral witnesses of the strange events reported that they were warned not to speak about what they had seen. Frank Samblebe ( the school principal ) put a general ban on the speech issue. Not a single report about these strange events was found in the Natonal Archives of Australia, nor in the archives of the Australian army or the Royal Australian Air Force. Allthough the goverment reports would be kept by certain investigators they were never published. 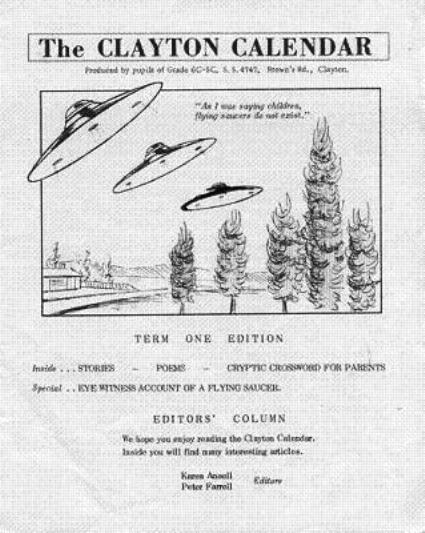 The observation of the Westall UFO was investigated by The Victorian Flying Saucer Research Society and the Phenomena Research Australia. Both groups described the incident as one of Australia’s largest unexplained UFO sightings. The team of The Victorian Flying Saucer Research Society arrived on Friday, 8th of april. The spoke to the students and looked at the ground marks. The team publiced a photo and a small report in their Australian UFO bulletin of December 2000. Brian boyle, an expert from the Phenomena Reseach Australia arrived on Saturday 9th of april with 4 military investigators at the field. Boyle had a period of several days – it was just Easter holidays – a lot of recordings (with a voicerecorder) and took samples of the ground marks. Allthough serveral witnesses saw 5 aircrafts of the type Cessna flying around the unknown object, researchers never found a report about these planes. Contact was made with the Moorabbin Airport (less then 5 kilometers southwest of the landing ), but the authorities had no knowledge of an aircraft from their airfield in the skies. According to the Royal Australian Air Force there were no military activities in the area on that day. Australian skeptics described the object as probably being an experimental military aircraft. Can you message me with a few pointers about how you made this website look like this, Id appreciate it. Great issues altogether, you simply won a new reader. What would you recommend about your publish that you simply made some days ago? Any certain? Enjoyed reading by way of this, quite very good stuff, thankyou . Great publish, very informative. I ponder why the other specialists of this sector do not notice this. You must proceed your writing. I’m sure, you have a great readers’ base already!|What’s Happening i’m new to this, I stumbled upon this I have discovered It positively useful and it has aided me out loads. I’m hoping to give a contribution & aid other users like its aided me. Great job. Woah this blog is magnificent i really like reading your articles. Stay up the great paintings! You understand, a lot of people are hunting around for this info, you can help them greatly. Mars Spirit rover was a robotic rover on Mars. active from 2004 to 2010. Spirit was one of the twins rovers send to Mars. (twin rover Opportunity) This rover went further then anyone could ever imagine. planned to travel just 600 meters (0.4 . NASA alien anomalies caught on film Once the race to conquer the space and to be the first nation to go in space started, a lot of materials, movies and pictures started to emerge with seemingly elaborate objects that couldn’t be . Are there underwater alien basis?